1 Combine Hellmann's® or Best Foods® Real Mayonnaise, green onions and cilantro in small bowl; set aside. 2 Heat oil in 12-inch skillet over medium-high heat and cook onion and garlic, stirring frequently, 3 minutes or until onion is tender. Stir in chicken, tomato, water, Bouillon Cube and chipotle chili. Bring to a boil over high heat. Reduce heat to low and simmer uncovered, stirring occasionally, 10 minutes or until liquid is absorbed. 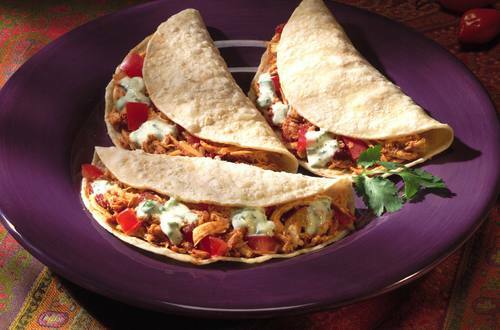 To serve, spoon chicken mixture onto warm tortillas, top with mayonnaise mixture and fold.